Producers of the Al Jazeera English show, The Stream, reached out last week to ask if I’d provide some commentary on today’s episode regarding Hollywood DEPPictions of Native Americans (that’s my pun!). It’s a neat, interactive show, and they had some good questions. However, I was given a 30-second window to comment, plus tweeting. For a topic this complicated (and controversial, especially among fellow Natives), I felt a little strangled for time. So in addition to my video on The Stream, I also wrote up this piece. By no means am I dropping anything here someone much smarter and more qualified than me hasn’t already discussed in detail. For more in-depth analysis, check out Native Appropriations and Reel Injun, just to point you in the direction of quality critiques. Hollywood’s go-to design of a Native American character is this: The stoic Indian of bygone yesteryears, with his bow and arrow, feathers and paint, and a HUGE chip on his shoulder (and now a bird on his head – the new acronym is SMBH, shaking my bird head). The character is generally under-developed, very surface-y in his motivations, and never the title role. The character is usually male, as well. Outside of the newest Disney-generated Native bird-wearing archetype, I’m thinking of movies like Dances With Wolves, Last of the Mohicans, and The New World, among others. Then, if you’re showcasing the rare female lead character, say, someone like Pocahontas or Sacajawea, you get the over-sexualized woodland sprite communing with nature and navigation alike. In both cases, Hollywood presents us with under-developed, historically and culturally inaccurate characters depicted as noble savages fraught with need for a great white savior. Now, critics of this line of thinking will often say, “It’s just a movie. It’s fiction. There are LOTS of fictional characters out there absolutely no one believes is how a real person acts.” Yeah, OK, but those characters are generally white, male, and heterosexual. The Privileged, if you will, because there are so many incarnations of them in media that it’s OBVIOUS there is no one mold for them. Hollywood tells us a white male can be anything he wants to be – today, yesterday, or even in the future. But a Native American male wears face paint, leathers, feathers (with or without the body of a bird – yeah, I have a big problem with avian appropriation, too), has a caring and protective white friend, and exists between the years 1492 and the late 1800s. Therein lies a big chunk of the problem: We have no modern representations of ourselves on the silver screen. This is a big reason I supported Twilight, and I get a lot of flack for that. (Side note #1: Chaske Spencer, aka Sam Uley of the Twilight Saga, was featured on The Stream show and he was amaze-bombs.) Believe me, I get it, and I whole-heartedly agree that just as Johnny Depp donned redface for Tonto, so too did Taylor Lautner for Jacob Black. Beyond this, however, Twilight did a great job of casting several talented indigenous actors for various big roles; in addition, the story behind Jacob Black (and I’m talking the book here, to deviate a little) describes him as a lead character who just happens to be Native. His ethnic heritage (usually the only depth a Native character has) takes a backseat to the love triangle, and his character development as a son and capable leader. And I really enjoyed that this was the case for most of the wolf pack characters in the books and – to an extent – in the movies. No war paint or feathers (albeit a lot of fur) or alcoholism to be found. This issue kinda came up during The Stream conversation, too. Chaske Spencer was asked about people seeing his role in Twilight as a sort of sellout move on his part. He had a fantastic reply, saying the franchise gave him an international platform to not only choose a more diverse range of films to act in (catch Winter in the Blood if you can! ), but also to advocate for great indigenous causes. Then the host asked him something along the lines of: So, you’re using your heritage as a selling point? And Chaske Spencer was like: No, I’m not “selling” my heritage. That’s just who I am… I was proud of Chaske in that moment, because he brought to light the point I make over and over again in this post: Native Americans are relevant only when cultural byproducts (like regalia, and smudge sticks, and feathers) are involved. We are not individuals. Returning to the topic at hand, even including Twilight, these Hollywood images leave us with few – if any – ways to interpret how a real, modern Native American looks, behaves, or what she desires. In our own familial and friendly circles, many of us will joke about how people ask if we really live in tipis, or ride horses all day, or if they can touch our hair. Funny, right? It happens far more often than any of us want to admit. We have to laugh to keep from crying. The frustrating reality here is this: We don’t exist as people until they actually meet one of us. And even then, developing a relationship beyond the silver screen takes a lot of time and patience on both my part and the part of the non-Native, which means true exchanges don’t often occur, because it really is just easier to live life based on assumptions (you know, like Skittle-wielding Black kids are inherently dangerous). So where does that leave us? On one hand we have a Hollywood Indian dramatized as a paint-and-feather-wearing warrior whose people have all but disappeared from the face of the Earth. On the other hand we have the fantastical Hollywood Indian, a werewolf. And in these depictions lie the danger of the Hollywood Native Stereotype: We’re like museum artifacts from “back then,” and the imaginative creations of a white profiter; we’re fun to look at, but absent from any modern or realistic context. That being said, you’d be hard-pressed to find either of these stereotypes in the real world today, and because those Hollywood images are what many people are working from, real Natives – and our issues – remain invisible. So when we have very real issues like crippling poverty, staggering unemployment, laundry lists of health issues, or even when we’re trying to enact positive change with protests against pipelines and predatory alcohol sales, we rate less than the latest celebrity gossip on the local news channels. Argh! I AM NOT YOUR HIPSTER ACCESSORY, dammit! It is so normalized and accepted in America that we see this (mis)appropriation of ourselves in music videos, fashion shows, Halloween parties, frat shindigs, and sporting events. We become obsolete pieces of art used solely for entertainment purposes. And just as Depp’s Tonto ended up as a carnival sideshow, so too do important tribal issues. Zimbardo explains how dehumanizing can trigger ‘good’ people to commit atrocious acts, i.e. the Jewish Holocaust, Rwandan genocide, and abuse by guards at Abu Ghraib Prison in Iraq. Dehumanization allows people to redefine harmful behavior as honorable, minimizes personal responsibility, maximizes apathy, and “reconstruct(s) our perception of victims as deserving their punishment” (p. 311). <—- Sound familiar? Read through some of the comments on my blog… Or better yet, through the troll-infested comment sections of news stories about Indian mascots or Hollywood depictions of ethnic people. In case you were operating under some delusion to the contrary, let me be the first to point out how alive and thriving racism is today. Let’s stop that whole "post-racial" fantasy, mmmkay? In the case of Hollywood whitewashing, the context behind the offensive Native imagery is at issue. In relegating Native Americans to Western or mythological roles, Hollywood perpetuates and popularizes racist trends proponents say “honor” Natives; mascots, in particular, which are the little racist brothers to Hollywood’s stereotypes. Mascots and Hollywood stereotypes exacerbate the issues plaguing Indian Country today by making the American public complacent and indifferent to those “Indian-only” problems, in addition to totally leaving out the fact that many of these issues are because of past and current U.S. POLICIES (I’m thinking in terms of assimilation, allotment, boarding schools, ICWA, VAWA, and – most recently – the sequester)! 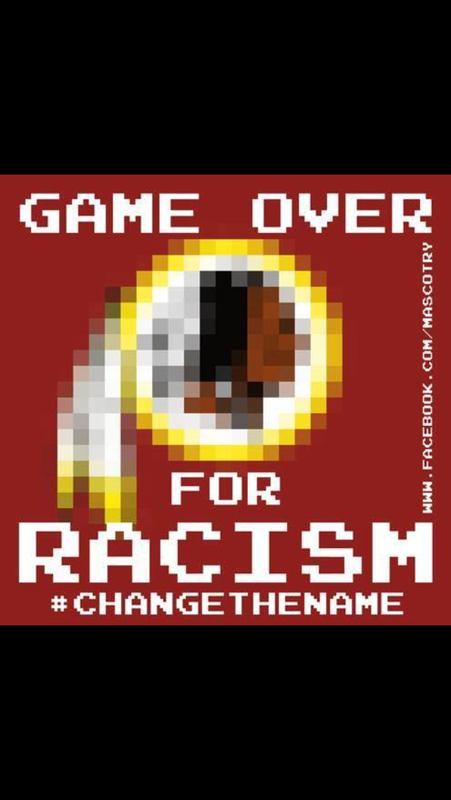 These images further divide Us and Them, because we Natives are nothing more than ticket sales and sports jerseys. Who cares about the Indians when there are REAL issues to deal with? Dehumanizing Natives through racist imagery has been the most effective modern means of annihilating the few of us remaining.